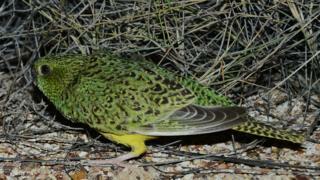 In 2017, ecologist John Young claimed to have found traces of the night parrot, one of the world's rarest birds, in the state of South Australia. On Friday, AWC - one of the largest conservation organisations in Australia - said it would retract his published research, after a probe found flaws. Mr Young denies any wrongdoing, telling the Australian Broadcasting Corporation: "I have no interest in any criticism." An independent investigation, commissioned by the AWC, and carried out by other scientists found major discrepancies in Mr Young's research. For the 2017 discovery, he had submitted a feather, found in a zebra finch nest in Kalamurina Wildlife Sanctuary in South Australia, as proof of the parrot's presence in the remote region. Supposed recordings of the parrot's calls at the sanctuary were also found to be "playback" of publicly available recordings. The bird's presence in a part of Queensland, based on photographs taken by Mr Young in 2013, is now also in dispute. "The methods used in this work were not consistent with the AWC's usual procedures," said chief executive Tim Allard in a statement on Friday.